Yesterday a vast majority of us in North America took a timeout from our concerns about nuclear threats from North Korea, terrorism from ISIS and ongoing hostilities from our polarized politics… to view a natural phenomenon that has not occurred here in 38 years. Those along the 70-mile wide path of totality observed a total solar eclipse. This stretched from Lincoln Beach, Oregon to Charleston, South Carolina. Others experienced a partial solar eclipse ranging from 50 to 90-plus percent. 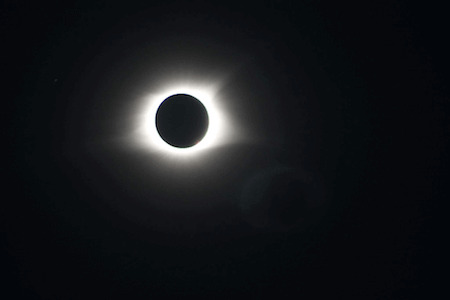 Here in Nashville – the largest U.S. city in the eclipse’s path – we were awestruck by this incredible event. Many of us stepped out of our 4Patriots office to view this natural marvel. 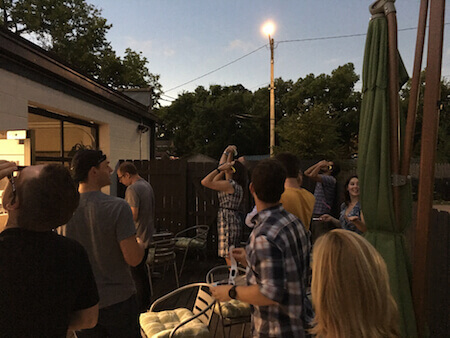 We cooked burgers and dogs on the back deck of our Patriot Headquarters… invited friends and family, and handed out glasses to watch the eclipse. It was nothing less than sensational. The wonder of this solar eclipse was all any of us could talk about for much of the day. For me, the eclipse was a stirring reminder of the awesome forces of nature that keep us alive every day. Just think… a giant ball of fire 93 million miles away sustains life on this planet… while our one and only satellite 240,000 miles away stabilizes the Earth’s rotation and causes magnificent tides. It’s just incredible to ponder. But the eclipse was also a reminder to me of how far 4Patriots has come as a company in nine years. And of how grateful I am to you for your support. We couldn’t have done it without you. Why was I thinking along those lines? Because our very first product – the one that launched us as a company in 2008 and put us on the map – was solar related. Power4Patriots. That’s our series of videos and manuals that teach people how to build their own solar panels, wind turbines, water heaters and solar heaters. And on a deeper level, this theme also represents our essence as a company. Taking what nature has provided for us – food, water and power – we’ve crafted all our products around the idea that while the future is uncertain, you can prepare for it in tangible ways that will protect yourselves and your families. We take the best tasting and most nutritious food nature can give us… and use modern-day methods to make sure it will still be good up to 25 years from now. Guaranteeing it will be ready no matter when you need it. We take our planet’s water and use sophisticated methods to remove up to 99 percent of the contaminants that can spoil it. Ensuring you always have delicious, pure, clean water to drink. We take the power of the sun to charge our generators so that they can supply potentially life-saving energy…. for when the electrical grid fails and you need it the most. Of course, this all comes back to self-reliance. We can’t control when the sun will shine or when the moon will cross between it and our Earth. But we can certainly bask in the beauty of a natural phenomenon such as a solar eclipse. And we can definitely control how prepared we are for whatever natural or manmade disasters may be carving a path toward us as you read these words. Thanks for taking this journey with us. I couldn’t imagine being on it without you! Editor’s Note: For those of you who would like to check out the products mentioned above, here’s a little more information. Don’t pay for another electric bill until you read this. Find out how people are slashing their electric bill all the while starting their path to energy independence with our Power4Patriots system. Though hundreds have gladly paid far more to disaster proof their homes and save thousands of dollars in the process, you can do the same… for just $10. For a limited time only. Our water crisis has already begun in this country, and you need to protect yourself now. Find out why people are raving about our Alexapure Pro. This breakthrough water filter transforms deadly contaminated water into clean, safe delicious water. It’s no secret that our power grid is failing and vulnerable to an attack. Our top recommendation in portable solar generators is the Patriot Power Generator. This revolutionary device produces an endless supply of life-saving electricity when you need it most – and without gas, fumes or noise. In an emergency – no matter what the cause – you’ll need food. And in a crisis, it disappears in a flash. Having good-for-25 years survival food is crucial. Do you have enough? For a limited time, we’re giving away a FREE 72-hour Survival Food Kit to loyal subscribers while supplies last. It’s a lifeline. This offer will be over soon. All I ask is that you cover shipping. Please don’t pass it up. Partial Government Shutdown Finally Ends… But Is Another One Coming Soon? I want to thank you from the bottom of my heart, for making our whole existence worthwhile with the stellar 4Partiots products. I have acquired most everything you mentioned and there is a peace of mind that I have, knowing I am prepared for that which is to come. Thank you for who you are and for all the good you have contributed to the world. Don’t ever change!!! May The Force Be With You!!! Thanks for your company and its innovative products for emergencies and survival. I enjoyed your thoughts and photos on the eclipse. Keep up the great communications and new products. Regards! Rick Bilbro, Raleigh, NC. Thanks, Rick. That’s great to hear! The phenomenon of all of creation the sun, moon stars, the earth and all it contains, just could not have happened accidentally. But a God the Creator is the only logical, albeit non-scientific explanation. I answered your call! FIVE Stars to the BBB! Thanks for all you do! God bless us all! God Bless you all. Keep up the good work.